Last week, as I pulled my car into a parking space at Howarth Park, I saw something small moving oddly through the underbrush in the woods above the parking lot. I gathered up my gear and my dog and went closer to explore. 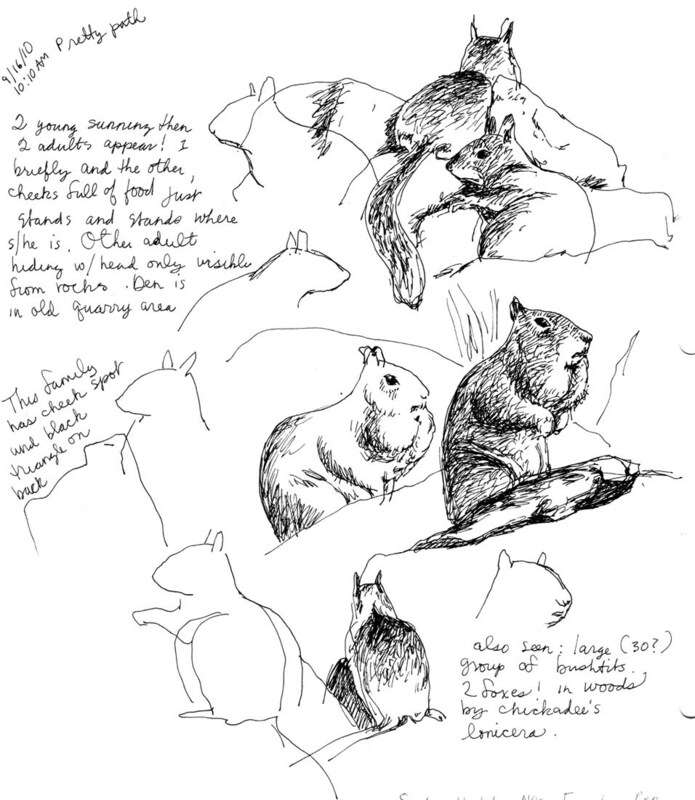 Before I'd gotten very far, I knew that I was looking at a nearly forgotten friend from my early adolescence, though in a decidedly different habitat than that of my pet guinea pig (Cavia porcellus) from many, many years ago. This guinea pig was hopping awkwardly about, stopping every now and then to eat some of the new grass sprouting all over the park. 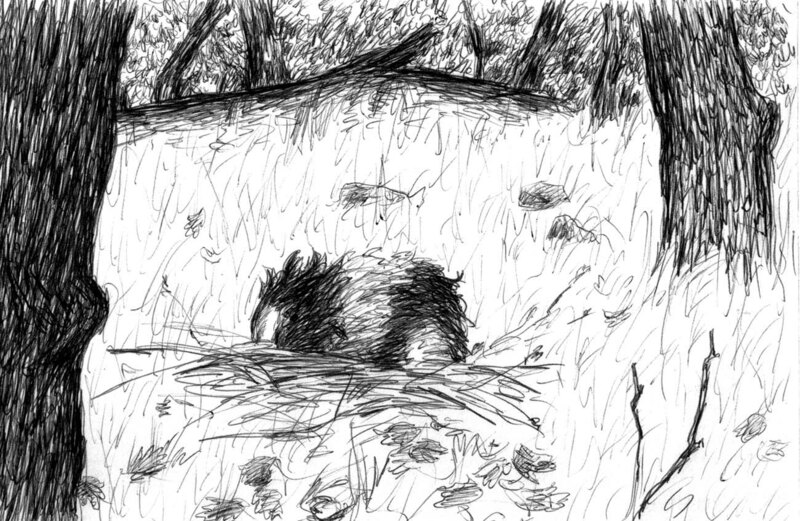 He was decidedly unconcerned as I drew closer but only to a point, at which he scuffled off at a distance. Chloe and I went on our way and when I got home, after our walk, I set about refreshing my memory about guinea pigs. I found that much of what I remembered was wrong. Guinea pigs originated in the Andes and were domesticated long ago, as a food source. There are some close relatives still in the wild but but it's not certain that the domesticated pig is descended from any of them. Although Guinea pigs are still raised as food in in the Andean highlands, they were enthusiastically adopted elsewhere as exotic house pets beginning in the 16th century, when European traders brought them back from their travels to the New World. I was relieved to find that guinea pigs still retain a preference for cool weather over hot, as our night time temperatures have been about 30 degrees F (-1C) for nearly a week. Back at Howarth Park, I returned the next day with some fruit and vegetables which the pig devoured with great enthusiasm, as long as I kept my distance. I began an internal debate about whether to attempt a rescue or allow the pig to live a shorter but certainly more exciting life at Howarth Park. I wondered if the pig missed the humans who abandoned him, or if life at the edge of the park was a welcome and exciting change from the more sedate, but possibly very boring domestic life of a household pet in a cage. Trying to imagine myself in this guinea pig's place, I felt that life in the wild would be my choice, in spite of the increased danger and hardship. When I told a friend about my predicament, she thought she'd prefer the cage or, rather, the steady supply of food and easy lifestyle. So, I'm trying to split the difference by taking food with me when I go to the park to walk. I hadn't seen the pig in a couple of days, because I've been going early in the morning when it's still cold and he seems to wait, as do many of the native inhabitants, for warmth before venturing out for breakfast. Yesterday I finally got a chance to see the pig, in the late afternoon, when I dropped off some food but he's adapting well to life in the wild and was gone before I got close. Most afternoons my husband, Chloe and I walk to downtown Santa Rosa to visit our favorite coffee place. We chat and watch the people and dogs that always seem to be bustling about. 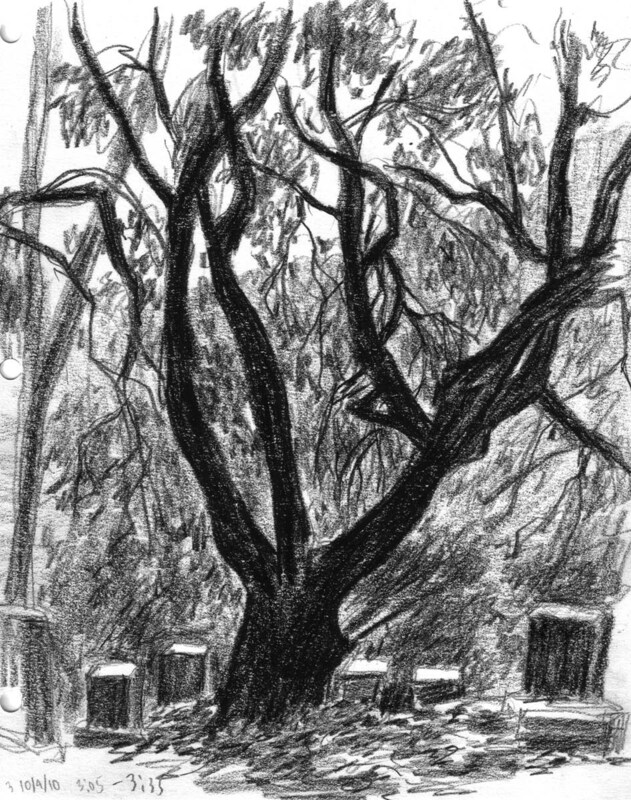 If we're not in a hurry, I'll do some urban sketching, mostly of the other people drinking coffee outside. There are often quite a few birds about, especially in the winter, eating pieces of muffin, bagel and cookies that end up on the ground. There's also someone who puts out handfuls of seed most days. We see Brewer's blackbirds (Euphagus cyanocephalus)and a few House sparrows (Passer domesticus). Last week, a hawk dove from on high trying to capture one of the blackbirds but it missed and was gone so quickly that I wasn't even sure what I'd seen until I'd thought about it a while. Oddly, there aren't any pigeons, though there are some living near our house, a quarter of a mile away. In winter the blackbirds begin to gather at around 4 p.m. on top of the building across the street, facing the sun as it rapidly sinks in the sky. Often, we'll see nearly 100 birds perched quietly at the edge of the roof, some of them preening themselves. Sometimes the whole group will suddenly lift off and wheel about over the small city of Santa Rosa before landing again, often when crows fly over, but usually for no reason that we can discern. One brilliantly sunny day, after days of rain many years ago, I was in our backyard when the air around me suddenly filled with graceful winged insects that drifted off and then disappeared. 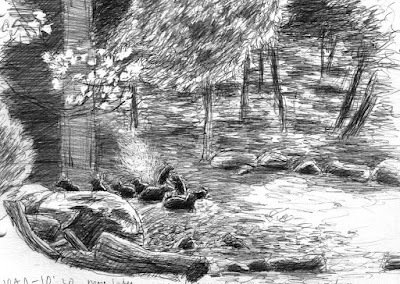 They seemed to be rising from the ground beneath me and when I looked I saw hundreds more crawling unsteadily about the flagstones beneath my feet. I captured one for later identification and watched as all of them became airborne and disappeared within an hour. 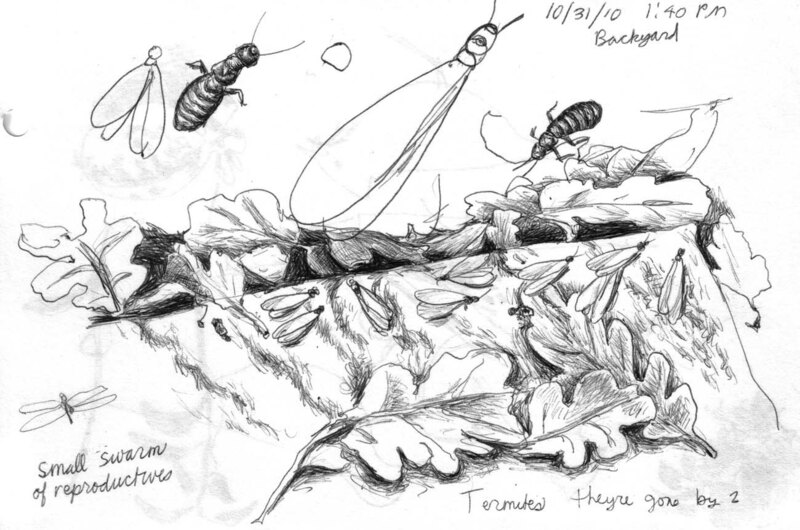 I was chagrined to discover that the beautiful flight I witnessed was the annual departure of reproductive termites from their nest. The one somewhere on our property. Uh oh. The nice exterminator who came the next day couldn't find any sign of invasion of our home but still felt strongly that we should begin an toxic and expensive monthly pest control program. We decided against it and have been keeping watch for signs that the termites have moved from the old stump beneath the house to the house itself. So far it hasn't happened. It turns out that termites, like the fungi I'm so fond of, serve an important function as one of the recycling crews of our planet. They recycle old, decayed wood and help keep the soil porous and rich with nutrients. Oh, and termites are considered choice eating by several species, including our own, some of whom consider toasted termite to be a culinary delight. 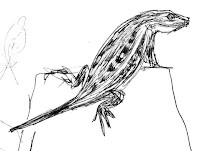 Earlier this year I watched a Western fence lizard (Sceloporus occidentalis) eat quite a few termites as they emerged from the ground to fly away. Most of the information about termites seems to be provided by colleagues and employers of that nice exterminator that came to our house after the first termite flight we saw. Here's some less biased information, including a wonderful video of an amazing termite skyscraper in Nigeria. It had rained in the morning and was supposed to clear up in the afternoon, so I changed my day around and went to the park in the afternoon. Ha! Paying attention to weather forecasters is pretty much like gambling with your life savings. It was gray and chilly and felt as though it was going to rain at any moment. This really wasn't a bad thing because I love that gray light for the way it makes every other color so brilliant that they almost glow, even the faded golds and tans of late summer in Northern California. 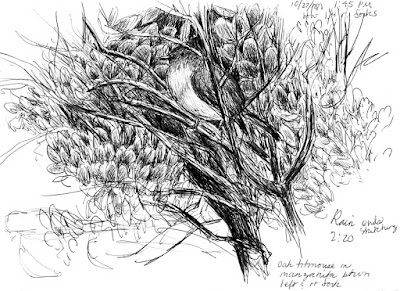 I was considered drawing a landscape until this Oak titmouse (Baelophus inornatus) landed in a manzanita (Archostaphylos sp.) 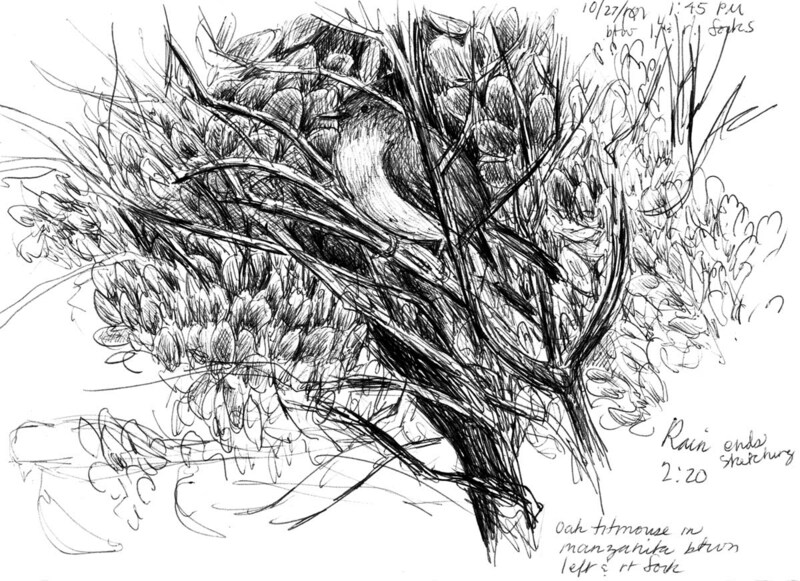 and preened long enough for me to get a sketch. After the bird left I worked on the leaves and branches until the rain that wasn't supposed to fall did, indeed, begin to fall. Since I was in a meadow with no umbrella (remember the part about believing weather forecasters?) 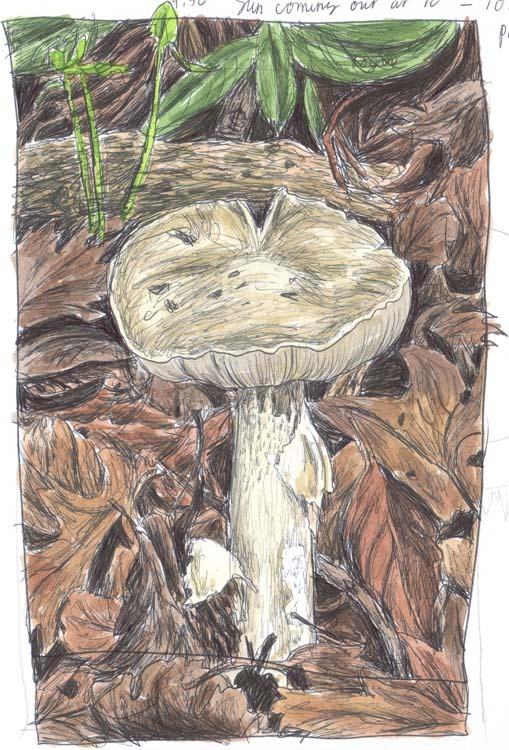 I cut the sketching short and toddled off to enjoy a delightful walk in the rain. In my last post I mentioned looking for a fungus called Hericium erinaceus or Lion's mane. Although I didn't find the one I was looking for, I did find this one fruiting in the Black oak (Quercus kelloggii) in another part of the park. I actually saw my very first Lion's Mane fruiting from this tree about three years ago. It fruited the following year then skipped last year and here it is again. If you find it early, this is an edible fungus, though not one I've ever tried to eat. 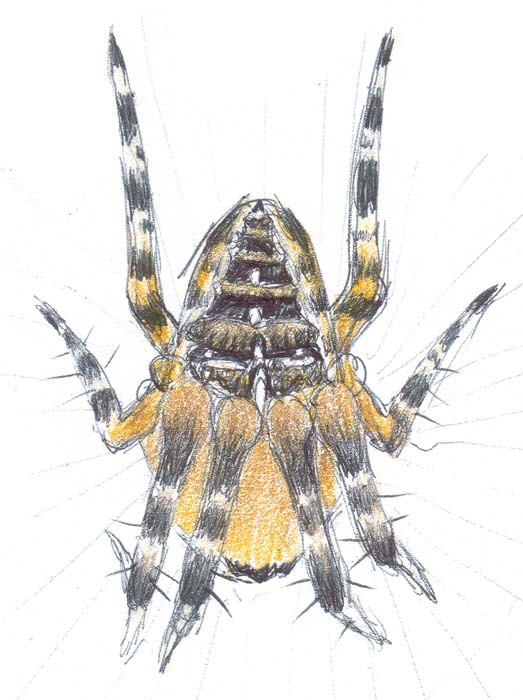 Although my sketch only suggests it, the rounded white area at the bottom of the organism is comprised of slender "teeth" or spines which produce the spores, rather than gills. This fungus had already begun to produce spores and had a white dusting on top. 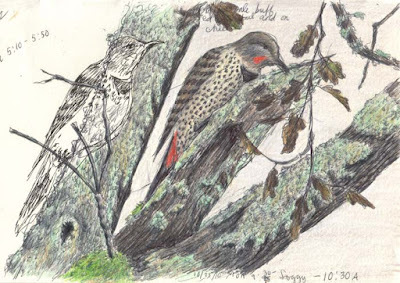 The voice of the Northern red-shafted flicker is what the beginning of fall sounds like here in Sonoma County. This year I heard the first flicker in August, which seemed a bit early, but now, in mid-October, it's hard to go anywhere in Howarth Park without hearing one or more flickers calling out to one another. My ears led me to this dapper fellow in an open part of the park with scattered Blue oak (Quercus douglassii), one gray day. 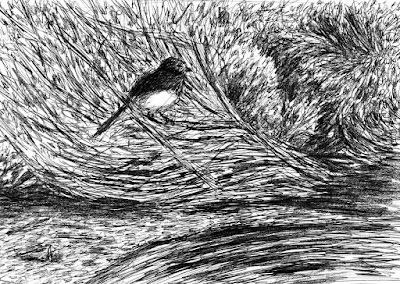 I started to draw him with a fountain pen but it didn't work out the way I wanted so I switched over to ball-point and then got carried away by the whole scene, not just the bird. 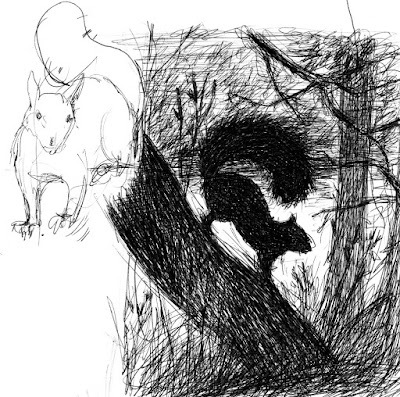 Thus, an inky ghost of a Flicker watches over the scene on the left side of the image. 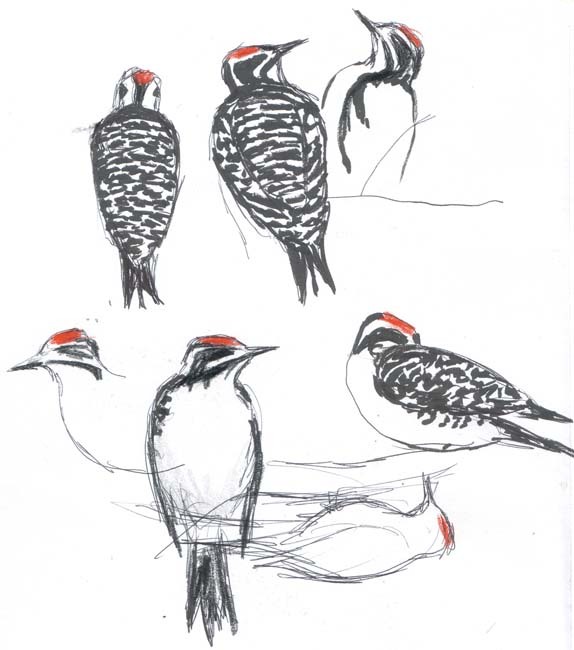 Although the flicker is a woodpecker it's commonly seen on the ground, foraging for insects. This one was foraging in some dead wood high up in an oak and stayed a good long while. Up to 45% of a flicker's diet is ants, along with other insects, and in winter, some nuts, seeds and berries. Here in the western part of North America, you're most likely to see the red-shafted flicker, while in the east the yellow-shafted Northern flicker is more common. As I mentioned in a previous post I've found California ground squirrels (Spermophilus beecheyi) to be excellent models as I learn to draw wildlife. 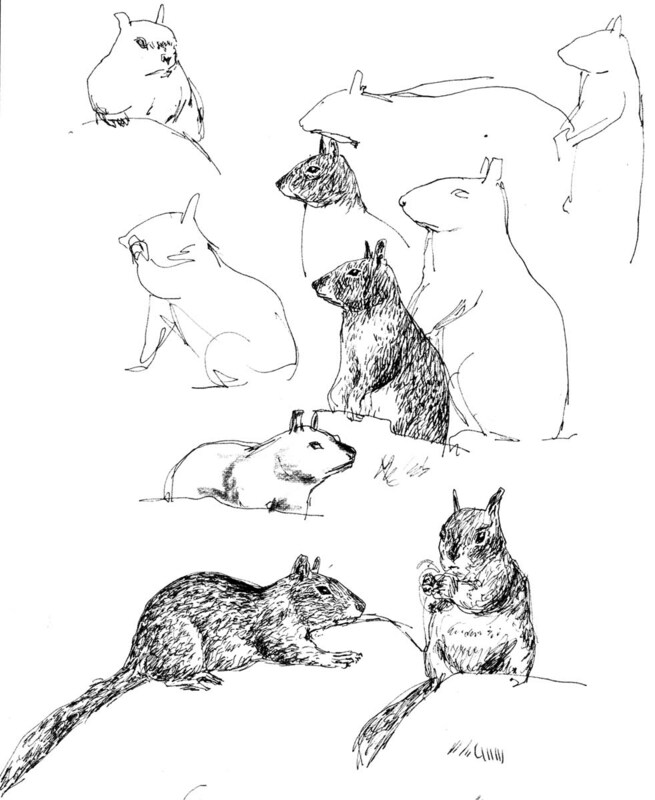 After spending the summer drawing the rather tame squirrels that have made homes in the picnic areas where there's constant human activity, I decided to begin sketching some of the wilder cousins out along the trails in the old quarry areas of Howarth Park. 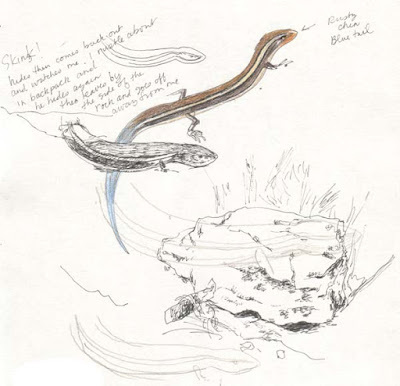 In early August, I noticed three juveniles basking in the sun as it rose and warmed the rocks. I didn't see any adults but heard alarm calls a few hundred feet behind where I sat. 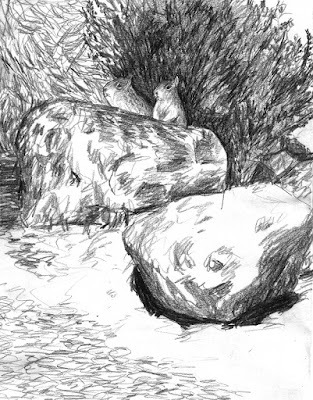 I stopped to visit and sketch one or two times each week and only saw the three youngsters, who generally appeared each morning as the rocks were warmed by the sun. 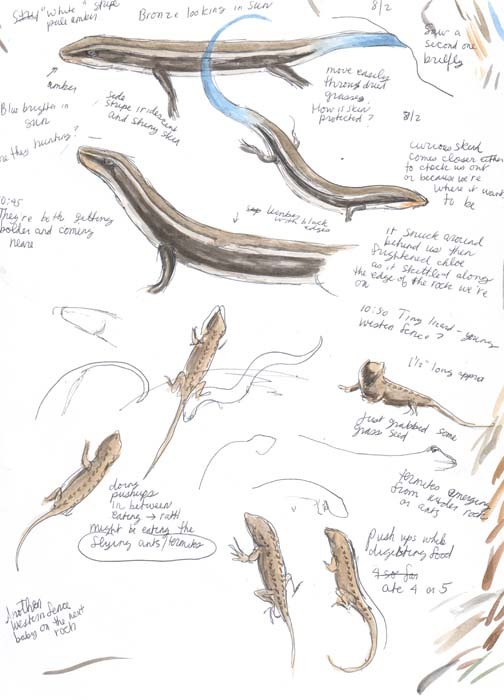 They would bask, then move about the grasses, eating seeds and playing with each other while keeping an eye on Chloe and I as we watched them. For almost a week, I only saw two of the young squirrels and feared that a predator had made a meal of the missing squirrel. Then, one day I saw all three together again and two adults, as well. One of the adults was carrying a large load of something in her cheek pockets. In fact, she seemed rooted to the spot, giving me the chance to get a drawing of her in all of her double-chinned glory. One sunny morning I started my walk at Howarth Park at Lake Ralphine. The trail around the lake is above the water. There are several areas right on the water that have been cleared out and are used by picnickers and fishers. In the early morning the sun rises up over a low ridge, grazing the lake and the land near it and as I walked I saw a Black phoebe (Sayornis nigricans) perched on a rock waiting for the insects that were beginning to buzz above the water as the sunlight warmed the air. Black phoebe was one of the first birds I learned to identify. The bird's coloring reminded me of a tuxedo and I always imagined the phoebe just getting home from a formal event. Phoebe's call is easy to recognize. Phoebe. Phoebe. Phoebe! Finally, if I saw a black and white bird bounce up out of a low tree or shrub, then circle back into it, then do it all several more times, I was quite certain I'd seen a Black phoebe. Because they don't seem to be so shy of people, they're much easier to spot than other flycatchers, who seem to stay high in the treetops and tend to blend better into their surroundings. There are very few places in Howarth Park that you can't find a family of California ground squirrels (Spermophilus beecheyi). They're quite tolerant of humans, adapting easily to our ways. Those that live in the areas most used by humans have come to depend on us for a steady diet of junk food, often fed by toddlers getting their first introduction to what can loosely be called wildlife. Deeper into the park, the squirrels are wary of humans but still much more tolerant of our presence than other wildlife. 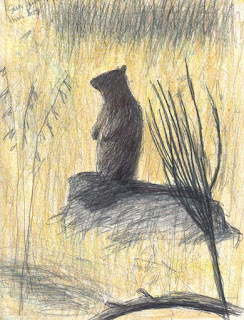 I've only begun sketching wildlife this past year. 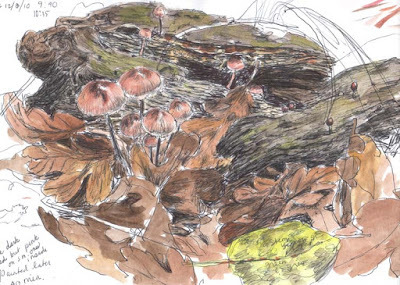 After several years of drawing fungi and plants, I found that I had no clue how to draw something that wasn't sitting still and posing for me or rooted to the ground. 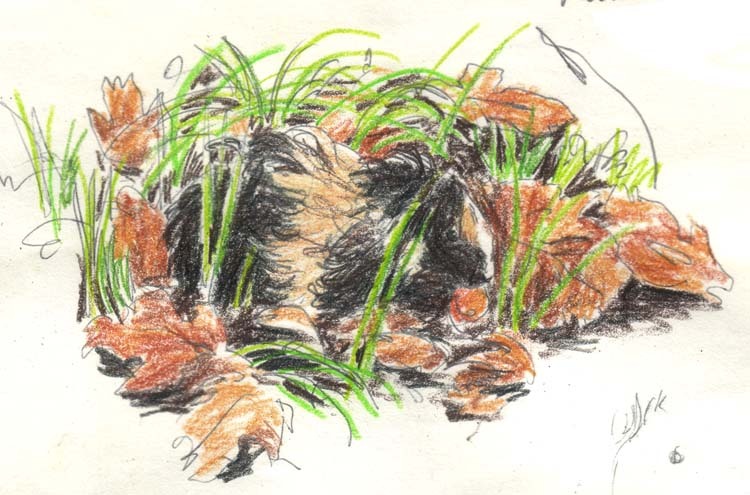 Birds were what drew me to wildlife but sketching the ground squirrels of Howarth Park has given me the best practice so far. Beginning with those that are well accustomed to humans invading their area, I've been able to learn a great deal about sketching small animals that are in nearly constant motion. 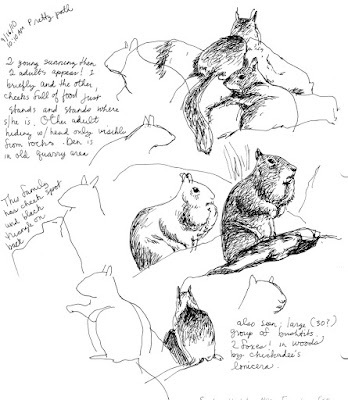 On days when it was just too hard for me to follow them with my pen or pencil, I could usually find some basking in the sun for long stretches of time, giving me the chance to do some figure drawing the way I learned it long ago, with a stationary model. 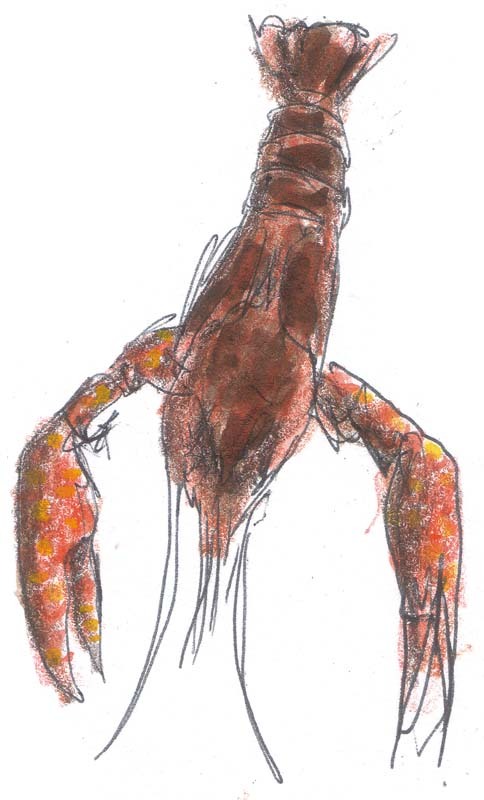 In the process of observing, I've found myself fascinated by creatures that I once took very little notice of. They, in turn, seem to be fascinated with the woman and dog who sit quietly and watch them. The first-year squirrels greatly enjoy tormenting Chloe by creeping closer and closer, causing the poor dog to lose control and lunge at the last minute, only to be brought up short by the leash as the devilish squirrel easily escapes. 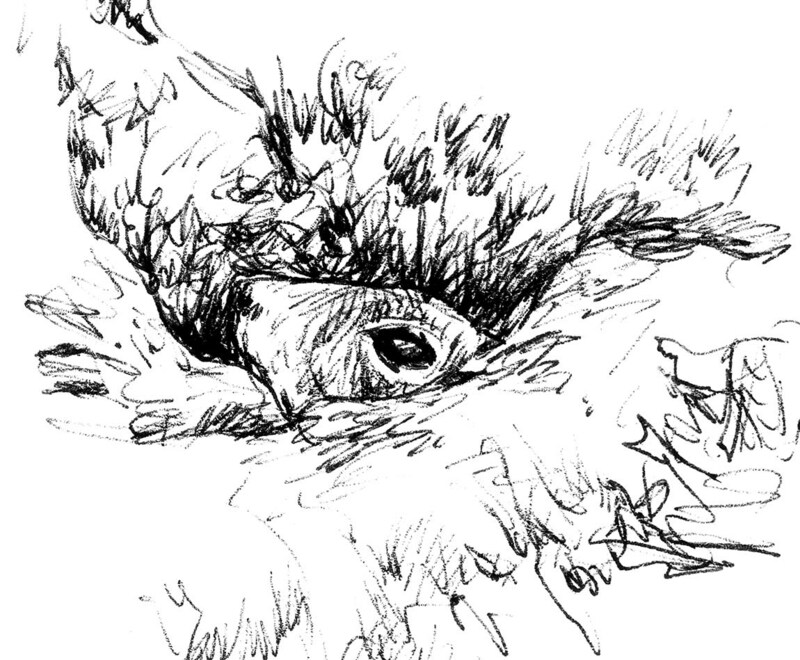 In one spot we like to sit there's a burrow opening about 2 feet in front of my feet where at least one of the young squirrels likes to poke her face out and watch us intently, with her nose going the whole time. If you're looking for help sketching any kind of creature that moves you might find Drawing Birds by John Busby to be a great place to begin. 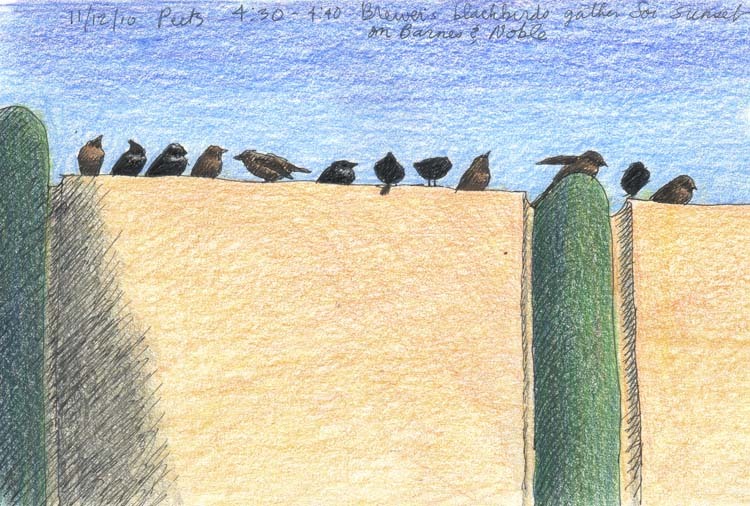 Although the focus is on birds, the techniques he discusses are as much help with ground squirrels as birds and the artwork by several different wildlife artists is truly inspiring. I went all summer and rarely thought about fungi. There were birds, ground squirrels, deer and wildflowers to distract me. Oh, and a couple of foxes that crossed my path every now and then, so fast that I had to pinch myself to be sure that I'd seen them. But, as the dry summer rolled along and the red dust of Howarth Park settled more heavily over rocks and shrubs something undefinable changed in the air and I found myself checking trees for signs of Inonotus hispidus, the first fungus that appears in the early fall at Howarth Park. On September 14 my vigilance was rewarded and I spotted this beautiful hunk of burning fungus love and felt my heart go pitty-pat at the thought of more to come. I've found one other just beginning to fruit on an oak on the far side of the park from where I found this one. I'm so excited! Inonotus hispidus is a wood rotting fungus and appears on dead or dying branches of trees, or on fallen logs. On one hand, it's sad to see it in a standing tree as it means that tree probably won't be standing for all that much longer. On the other hand, Inonotus hispidus and other wood rotters keep forests and woodlands clean by composting old, diseased wood. Although this tree will fall, the fungus will help pave the way for a new tree to sprout from this tree's acorns. Even though it's begun to feel like fall here in northern California some days still have a bit of summer to them. Last week, the fog that's been keeping it cool was pushed offshore by high pressure from the east and we had sunny, cool mornings that warmed up quickly. At the end of our walk Chloe and I made a stop at the picnic area to watch the resident ground squirrels as they climbed live oak and coyote brush to nibble on leaves and accept handouts from small children and their parents. 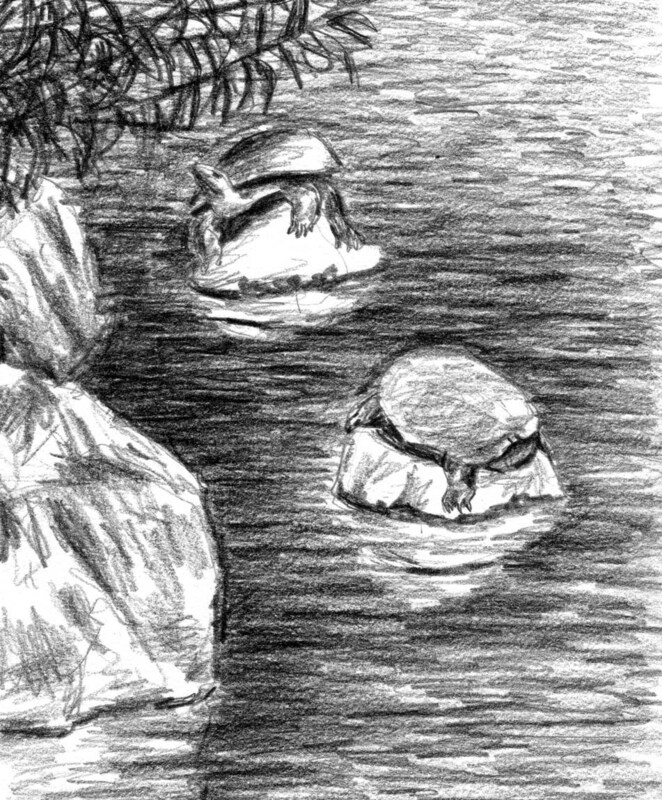 Looking out over the lake I was amused to see two turtles lollygagging on a couple of rocks in the sun. I drew quickly, thinking they'd be off before I could finish the scene but both were still about in the same positions by the time we wandered off. 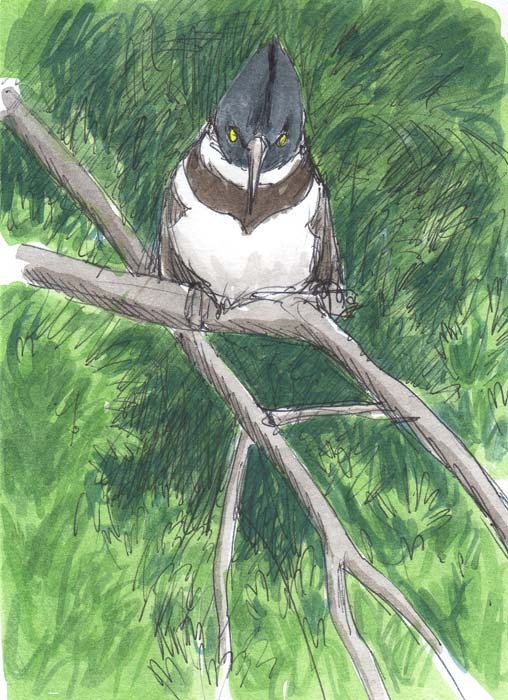 One afternoon, from my living room, I heard a loud pecking noise, louder than the sound of Scrub jays cleaning our gutters or the Oak titmouse beating open a sunflower seed on the platform outside the kitchen window. Curious, I went followed the pounding toward the kitchen. There wasn't anything on the feeding platform. Looking out another window, toward the side of the house I spotted a Nuttall's woodpecker (Picoides nuttallii) drilling a hole into the wooden fence attached to our house.Once he saw me, he moved about the fence then a tree above it, and finally left the yard. Although I often see these woodpeckers foraging in the canopy of the valley oak in our backyard, I haven't seen them in our front yard since early spring. 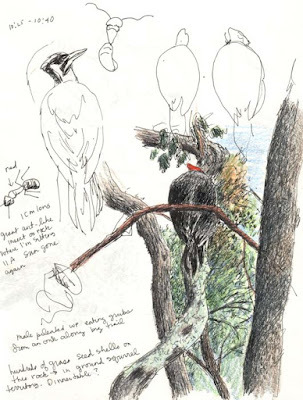 Last week I suddenly began to see and hear birds back in the woods and along the water at Howarth Park. I generally don't walk around the lake, mostly because the trail can be crowded and because I find very few fungi along that trail. But there aren't any fungi at this dry time of year and as the summer ended it seemed to be the most exciting part of the park, so I've begun or ended many of my walks with a turn around Lake Ralphine. 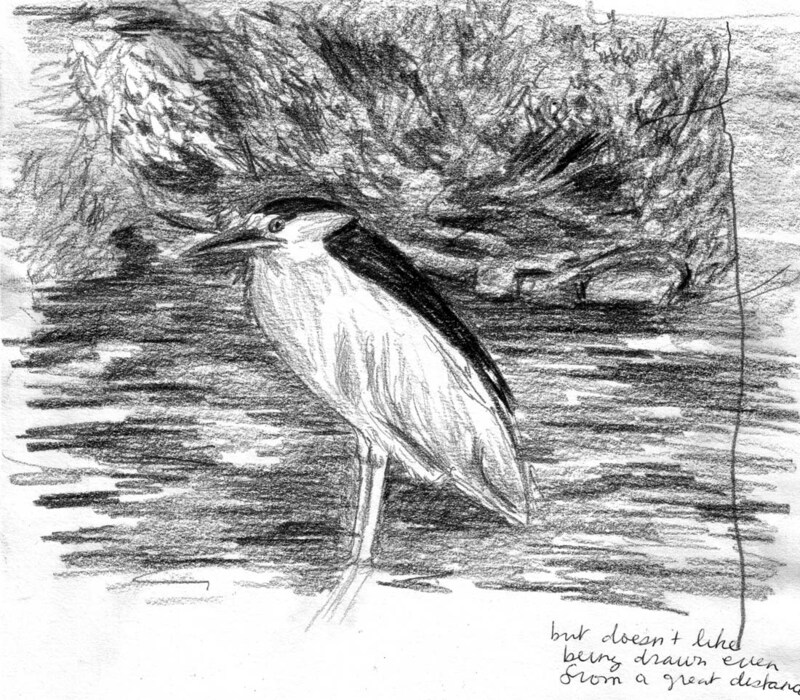 The other day I was rewarded when I spotted a Black-crowned night heron (Nycticorax nycticorax) hunting at the far end of the lake. 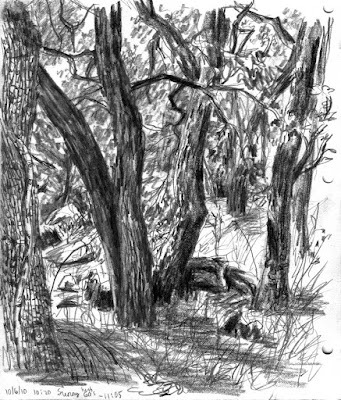 There was even a shady spot for me to sit down and draw. The heron tolerated my intrusion for a while then picked his or her way into the overhanging willows and out of my view. 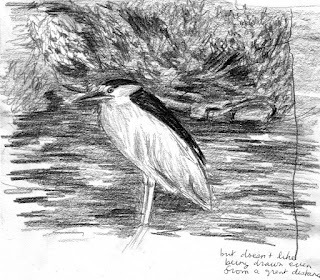 While visiting All About Birds to find out if it's possible to tell male night herons from female, I followed a link to some wonderful bird sketches by Maria Coryell-Martin, the September 2010 artist of the month at All About Birds. Oh, and although All About Birds makes no mention of difference between male and female, oiseaux-birds.com describes the female as slightly smaller, paler and with shorter nape feathers than the male. 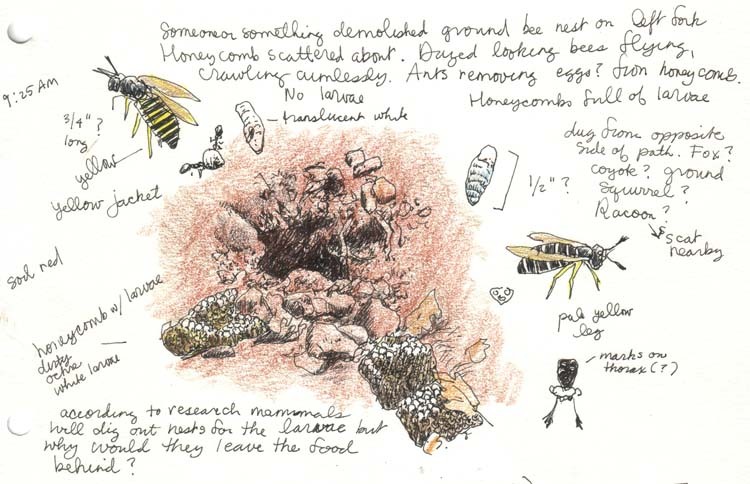 One of the really great things about field sketching is that you never really know what you will find. Some days, it seems that there's something I want to draw every few steps and there are days when I can't find anything I want to draw. One morning at the end of August I found a hodgepodge of little wonders going on at Howarth Park. 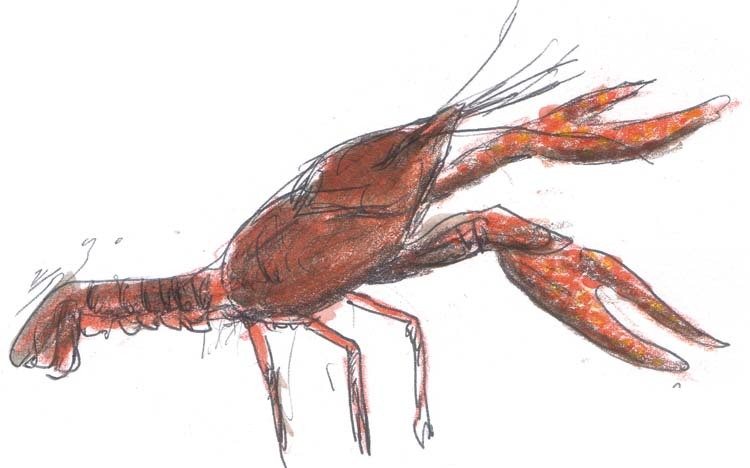 First I spotted a crayfish wandering awkwardly on the trail above the shore of Lake Ralphine. Lately I've seen at least one every time I walk on the lake, if I'm early enough. This one froze into the most threatening position it could muster and stayed that way until I unthinkingly moved my arm outward, which caused him to back up, tip over, right himself and head briskly, if clumsily, to the safety of the water. I was able to get a good look at his remarkable face before that happened. 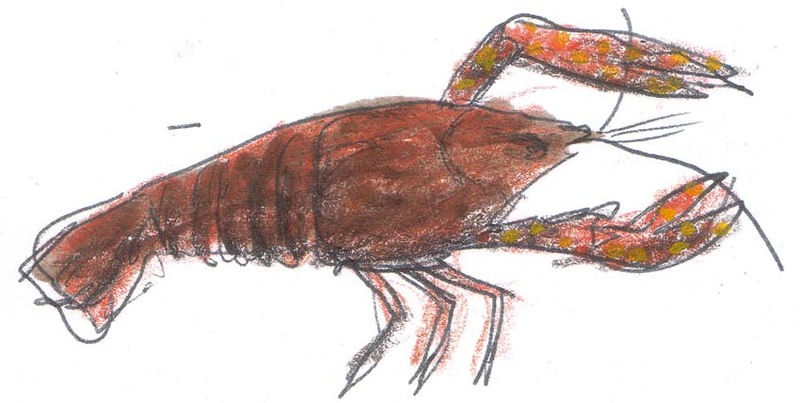 I also discovered that there are two stubby little legs just under his mouth centered between the claws, something I'd never noticed before, since I don't usually get a lot of face time with the crayfish. Chloe and I wandered away from the lake and up onto the south ridge where the sun was getting very hot. I walked as quietly as possible which allowed me to sneakily get closer to western fence lizards (Sceloporus occidentalis) along the trails before they'd skitter off under rocks. There were several very small ones that weren't quite as quick to disappear as the larger lizards. Finally, we stopped off to check on the Skilton's skinks (Plestiodon sketonianus) that we'd seen in early August. They weren't there and it looks as though something bigger may have taken over their place. Chloe sniffed around under the rock with great interest which ruled out a snake (she's terrified of them) and suggested rodent, a species of great interest to her. We took refuge in the shade of a blue oak (Quercus douglasii), in the process irritating a western gray squirrel (Sciurus griseus) a fair distance away from us. She stopped traveling through treetops to stamp her front paw at me, something I've seen several of these squirrels do when aggravated. When the stamping didn't get the desired result she ran down the tree and off away from us. 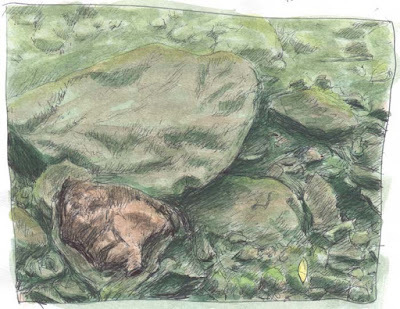 I sat a while on the edge of an old quarry, gathering my thoughts and deciding which trail to follow next when a large speckled fly flew up and hovered by my hand. 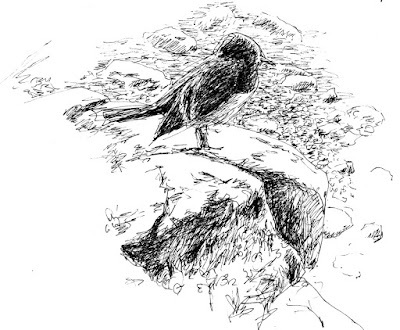 It landed on the rock I was perched on and rested for a bit, giving me the opportunity to quickly sketch it so that I could take it home and try to identify it later. It appears to belong to tribe Anthracini. Last week, I was hearing the loud calls of a group of about four Belted kingfishers (Ceryle alcyon) as I walked around Lake Ralphine. The other day a male actually sat still for a while on a low hanging branch, long enough for me to sketch him. This group of kingfishers are rowdy birds, yelling loudly and chasing each other around and across the lake. One day I watched as a young Cooper's hawk (Accipiter cooperii) flew in and perched in the same tree as one of the kingfishers. The kingfisher began to screech and dive-bombed the hawk several times. The hawk maintained it's post and it's equilibrium and the kingfisher eventually flew off, screaming her displeasure for all the world to hear. These are not shy and retiring birds! ...kingfishers, when about to dive, appear to be using the two white spots in front of the eyes as sighting devices along the line of the bill to fix their prey and, by doing so, possibly to correct for the refraction of water. Well, it's not the most satisfying explanation but will have to do for now. In the past couple of weeks I've been finding bird feathers littering the earth, just about everywhere I walk. Most of the feathers I find are from American crows (), but I've also found others at Howarth, including this 13 cm long owl feather. 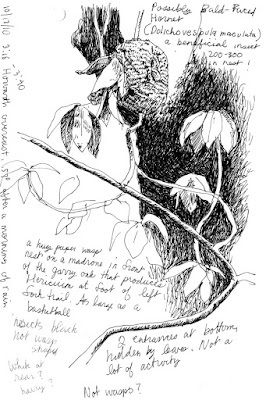 Looking in my Sibley Guide to Birds , I found three owls that might dwell in Howarth Park. 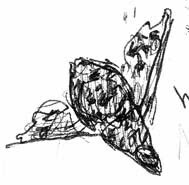 I didn't think I'd be able to identify the owl this feather came from but The Feather Atlas has given me a tentative identification of a Western Screech Owl (Megascops kennicotti), a small nocturnal owl that's equally at home in open woodland and urban and suburban settings. The reason I know it's an owl feather is that, when I found another one a few weeks ago, my friend, JoAnn identified it immediately by the fine hairs covering the whole feather, which appear to help muffle the sound of the wings moving through the air, allowing the owl to fly silently. While drawing the owl feather I noticed a lovely spider and web stretched across my outdoor work space (our umbrella-covered patio table). At this time of year, these webs can literally be run into just about anywhere! Even though they're large and usually stretched across an open space, it's easy to miss them when the light is wrong. 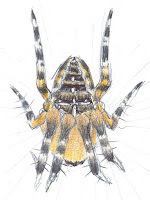 If that happens to you you'll find yourself snared by the European Garden Spider (Araneus diadematus) that built the web. 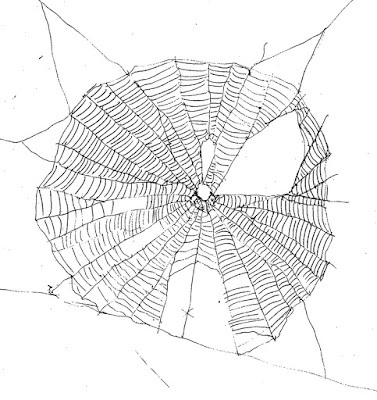 The female is the web builder and, apparently, she eats the web and all of the caught prey each night before building a brand new web for the next day. A few days ago I drove south to the outskirts of Rohnert Park to visit Crane Creek Regional Park. It's small but full of treasures. It's in open grassland and home to many wildflowers in the spring, as well as many birds and hawks that I don't usually find in the more heavily wooded Howarth Park. The grasses were as tall as I am and bleached pale tan, looking quite lovely against a brilliantly blue sky. On one, I found a rather large (2cm long), colorful insect and sketched it. 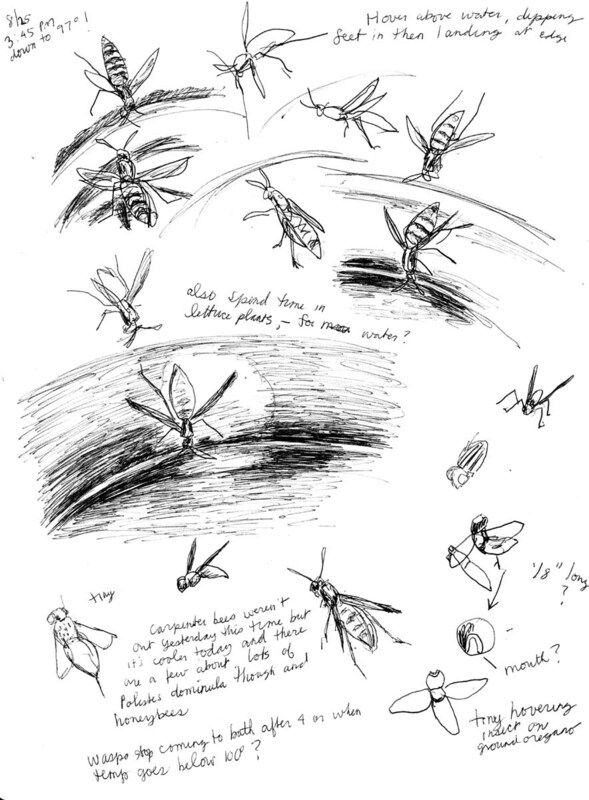 Insects aren't always amenable to being sketched. 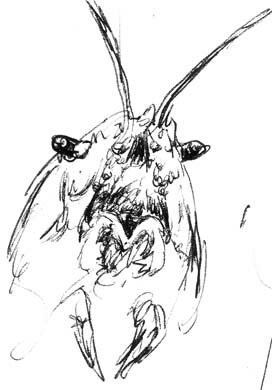 Imagine a giant insect hovering over you and peering at you through a magnifying glass and you get the idea. Anyway, this one was a very cool customer and more or less ignored me as I drew. Later I was able to identify it as a Bordered plant bug (Largus sp.). 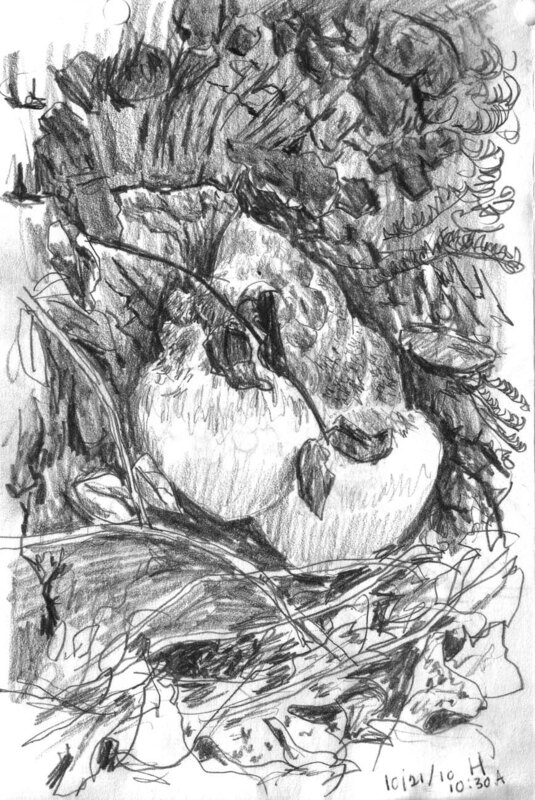 The bird sketch was an attempt to capture the markings of a Lark sparrow (Chondestes grammicus) that I saw feeding it's offspring on a trail. 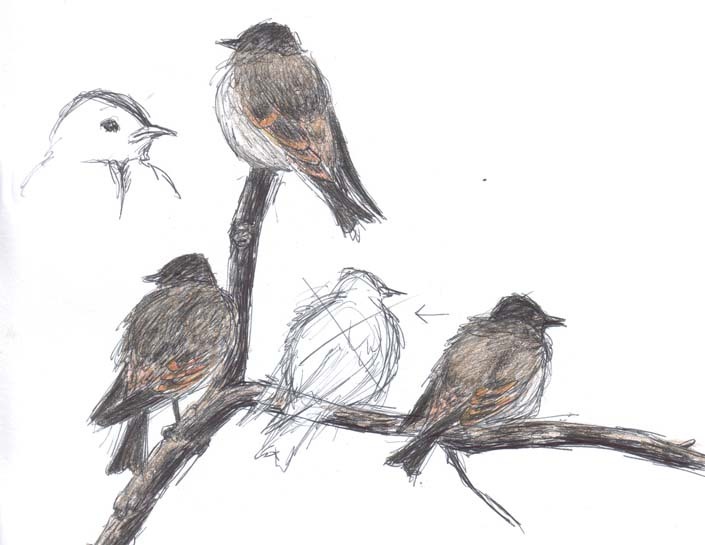 They're lovely little birds but their markings are like a jigsaw puzzle to me and it'll take some more study to capture them. In summer, I rarely think about ticks at Howarth Park. They seem to disappear when the rain stops. 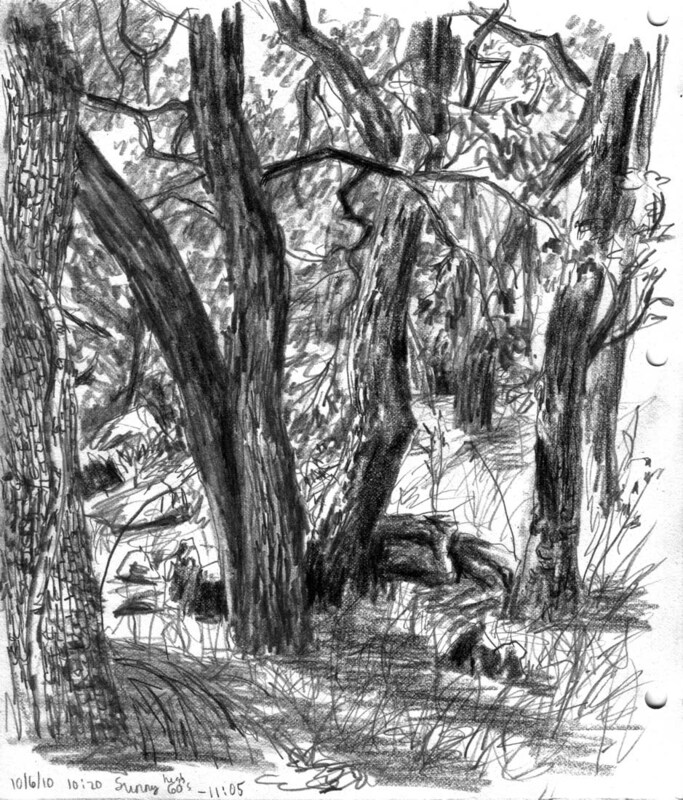 At Crane Creek, I wandered off the trail to try to blend into the scenery and get some birds sketched, without taking my usual precautions against the nasty little bugs. 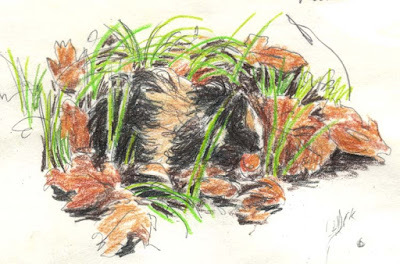 The grass had formed several inches of matted, bouncy padding above the ground and it was odd to sit on, and I worried about Chloe and the many foxtails surrounding us, so, after only a few minutes, I picked up my pack and my dog and went back to the trail. For the next several hours I kept finding ticks on my body. Ick! Chloe came away unscathed, amazingly. Once I'd gotten them all off, I wondered why there were so many at Crane Creek and so few at Howarth and came to only one conclusion -- rodents! Crane Creek is a haven for the California vole, a rodent that loves open, grassy places. Although I only saw one that day, I surmise that the wet winter and plentiful grass probably caused a population explosion of the little varmints, which in turn caused a population explosion of the ticks. These weren't deer ticks but I didn't save any to sketch and identify. I do keep meaning to do that but when I find them I only want to see them gone. Anyway, I'll stick to the trails for now and make sure to button my sleeves and tuck my socks into my boots the next time I'm there! At just about any location in Howarth Park I can look up and see Violet-green swallows (Tachycineta thalassina) circling above me. 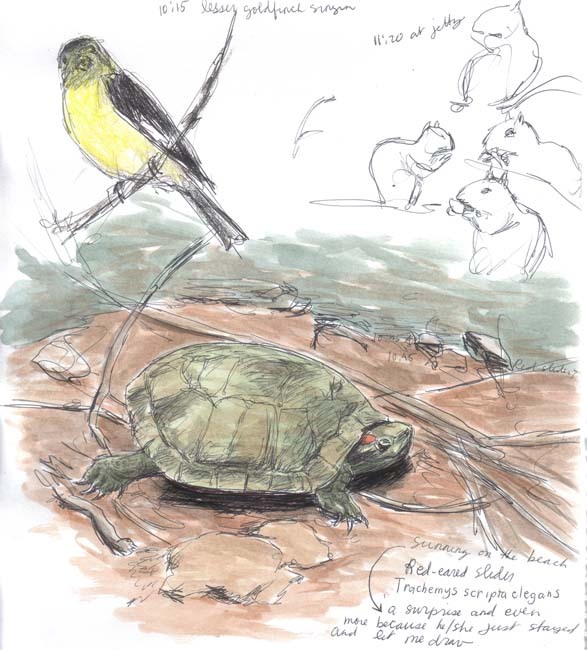 In the past few months, while sketching ground squirrels at the edge of Lake Ralphine, I almost always see some Violet-green swallows flying low over the water to catch insects along with another swallow that moves so fast that I've never been able to tell much more than that it was brown. I always meant to look it up when I got home and always forgot by the time I got here. Today it was cold when I set out on my walk so I just kept moving, hoping that the sun would come out from behind the fog and warm things up. A few Violet-green swallows circled overhead but it seemed that most other birds were huddled up somewhere trying to stay warm. 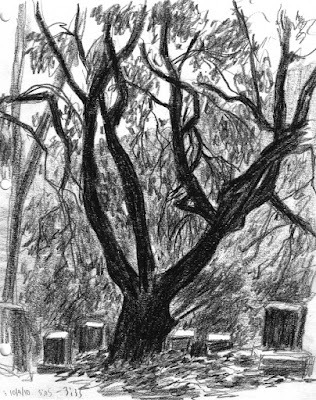 The light was rather gray and dingy, not very conducive to sketching, so I found myself walking just for the sake of walking, a pleasant change from my usual industrious search for something to draw. I enjoyed the quiet and the muted colors and, most of all, the opportunity to keep my hands warm in my pockets. Chloe likes to go the long way around Lake Ralphine and today I indulged her. Toward the end of the trail around the lake, as I reached the dam that marks the beginning of the end of the walk, I heard the unmistakable sound of young birds calling for food. Looking out toward the lake I saw three little puffed out birds sitting on a snag, with their heads popping out of the fluffy down just enough to call out with great frequency. 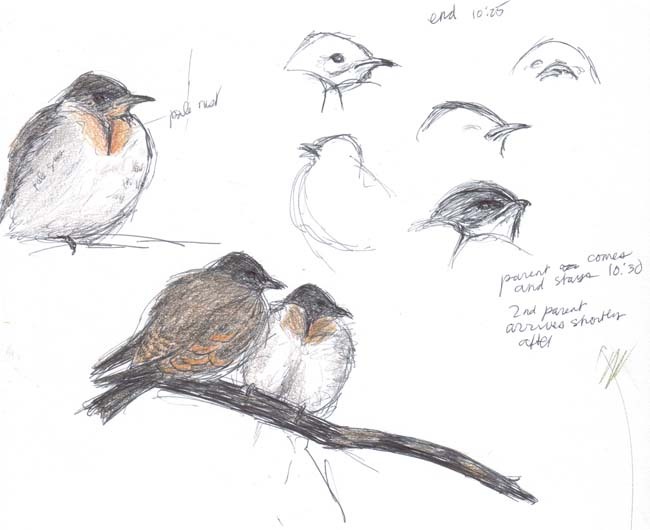 I immediately recognized them as young "other" swallows and began to sketch, thinking they'd be gone in moments. They stayed right where I found them, except once when something big flew nearby but out of my range of vision. 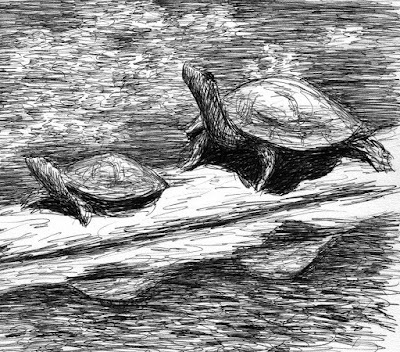 That caused them to flutter off of their perch and circle wildly until they settled back down and resumed their positions on the snag. Both parents flew by frequently and dropped food into the open beaks without landing or stopping. The youngsters fluttered their wings and called out loudly each time they saw a swallow fly over, even when it wasn't one of their parents. 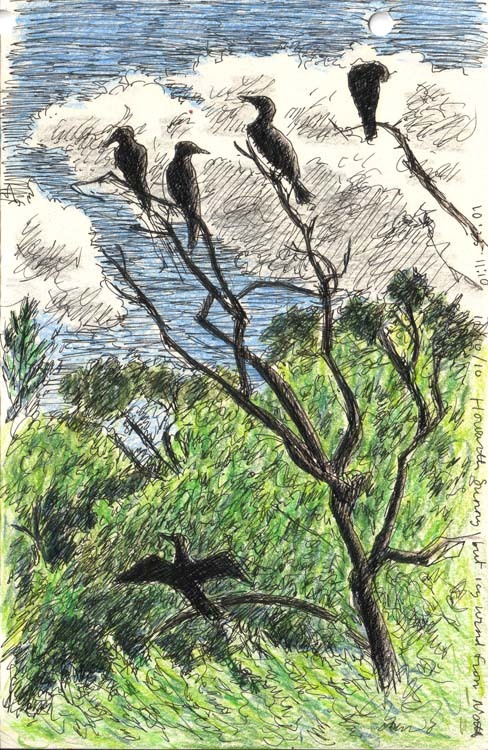 I sketched for 45 minutes and, at the end, one parent came and perched on the snag for a very brief time, until the other parent came and did some sort of maneuver that caused the first parent to go flying again and then they both landed and stayed on the snag before taking off once again. Now I know what to call "other" swallow --- Northern rough-winged swallow (Stelgidopteryx serripennis). The name comes from the series of barbed or hooked primary feathers on the wing, which can be felt, though not seen. No one seems to know why these feathers are barbed. Yesterday I was able to get myself going early enough to arrive at Howarth Park before the sun emerged from behind the fog and before the other humans began to arrive en masse. Most days that I walk at the park, I walk a counter-clockwise loop through the trails. Today, I was feeling adventurous so I walked clockwise. I always seem to forget what a difference there is when I do this! It's like taking a whole different walk, even though I cover the same trails. The first part of the walk was in the gray, even light of a foggy morning. As the light grew brighter and we headed to higher ground I began to hear birdsong and see dragonflies. Suddenly, the sky was blue and the sun cast dark shadows against brilliantly lit fields and trees. When the light changes that way, I always feel as if I've suddenly entered an entirely different world. I love the gray foggy world, where every spider web is visible and you can look inside and easily see the spiders in the cool, even light. Then the sun comes out and it's world of nearly black shadows and bright washed out colors. The spiders and their webs disappear, unless you look very closely. 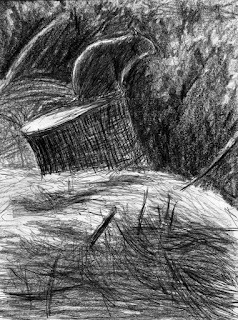 Suddenly, the strong shadows draw my eyes farther out to the shapes of rocks in yellow fields of dried grasses and the shapes of the shadows in the trees. I haven't been seeing much of the wilder California ground squirrels (Spermophilus beecheyi) since breeding season began, but they've begun to be more visible, looking rather majestic, for rodents, in that bright early morning light. One appeared to be surveying it's kingdom in the open, rocky grassland near the edge of the park. I was drawn to the other one by it's call of alarm as it sat on lookout from it's perch above a large brush pile between Howarth Park and Spring Lake Park. I never discovered the cause for alarm and watched it relax as I sketched from a distance.